Our two-story, two-bedroom villas feature a fully equipped kitchen, two fireplaces, whirlpool bath, and a private backyard with a spa. Each villa offers a quiet, relaxing retreat amidst the backdrop of beautiful Cave Creek. Watch a magnificent desert sunset from your private backyard spa, or enjoy a romantic evening dining under the stars. The comfort and beauty of our resort will amaze you. 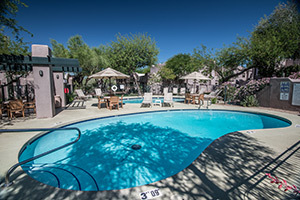 Book online for the best rates and plan for a memorable stay at Villas of Cave Creek Resort!